Did you know, Meta Box Builder has custom attribute feature can bring you a flexible way to create WordPress custom meta box fields and you can create columns also? To apply columns style for your custom fields, on your field in Edit Meta Box page, click “Show Advanced” to show Custom Attribute section then click “Add Attribute”. On the key textbox, enter columns which will add to columns attribute to that field, and on the value textarea, enter the column size. That’s based on 12 grids system. For example, if you enter 4 to value, then the column will has one third size of row. After that step, don’t forget to Save Meta Box, see your results. 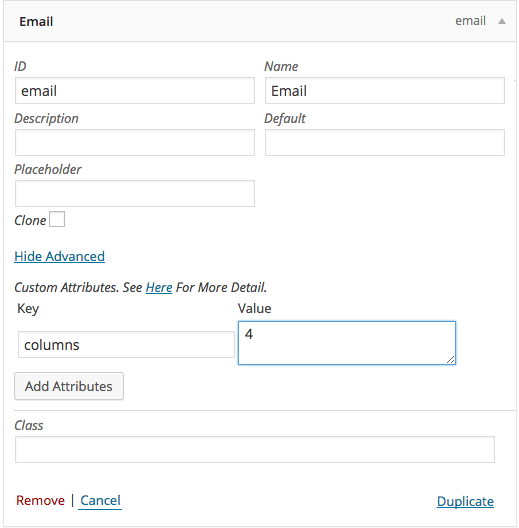 Note: Meta Box Columns extension is required to create columns.